Music: Remedial class for any jazz afficionados still trying to get Monk. The Gramophone said at the time of the original release: “It is convenient to have these 1952 and 1954 trio performances on 12-inch LP. The recording quality has been cleaned up in the remastering process although no amount of tape surgery has been able to correct the deficiencies inherent in the instrument used by Monk for the 1952 dates. On four tracks in particular it is clear that the piano needed tuning before Thelonious started to play on it. 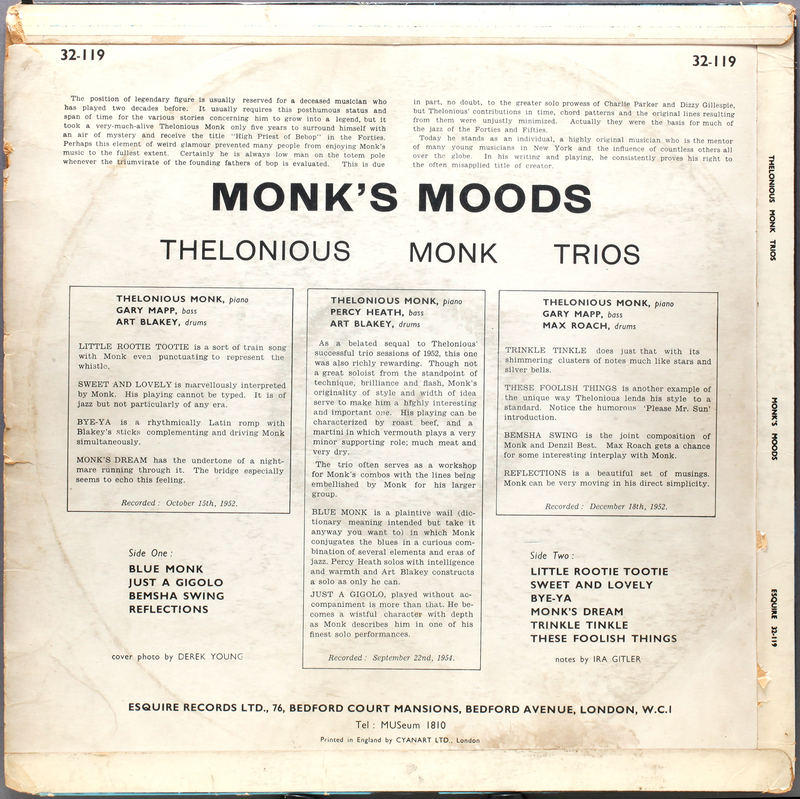 These trio tracks are essential reference works, Blue Monk in particular, for this was the prototype version of something which has been recorded again and again. Gerry Mulligan was right when he said this sort of thing had a studied informality, that Monk has worked hard to achieve“. RVG and scratched-out first Prestige catalogue release number replaced by the reissue catalogue number. ie all-American original mother and stampers as the source of the UK pressing. Below I am trying out ways to capture the run-out etching at the same time as the labels in the same photograph. If I can find a way to do this it will provide the clock position and all the relevant etchings all in one. It is possible but labour intensive. London store, in the rack, modest price, why not? For once, no great story. This entry was posted in Esquire, Thelonius Monk and tagged Art Blakey, Esquire, percy heath, Thelonious Monk by LondonJazzCollector. Bookmark the permalink. 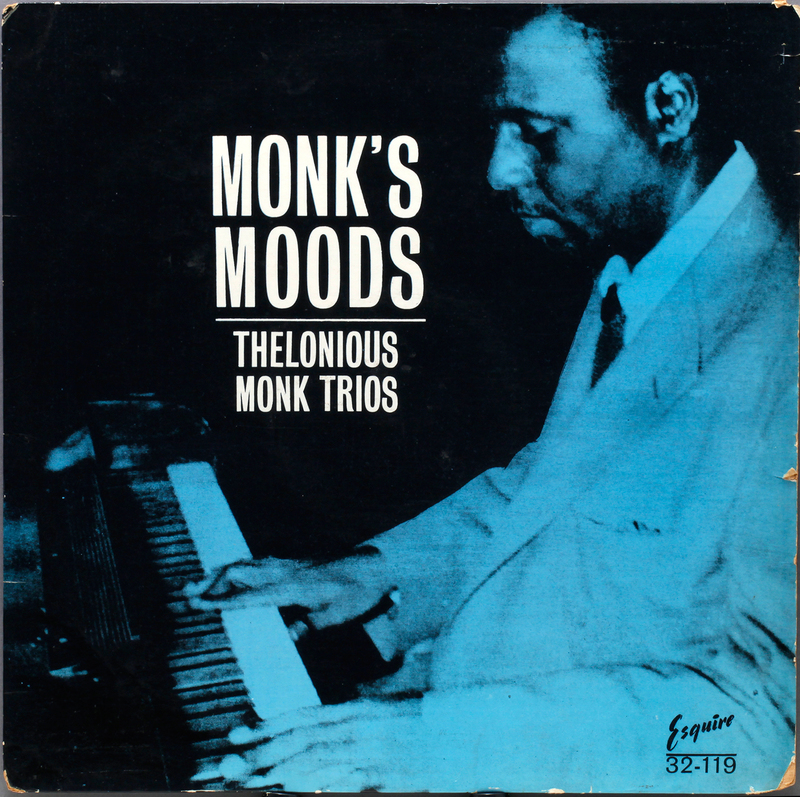 Anyway, whatever it is, I can’t put a finger on it, but for some reason, whenever you have Monk on, you eventually have to sit down and just listen. Let it soak in. Experience it. And even though some of us may not be into CDs, I strongly recommend everyone to lay hands on the brilliant reissue of Straight No Chaser, with some superb bonus cuts and a lot of the tracks -initially edited down due to the LP’s time restrictions- have been restored in their original full length. A killer CD. Last but not least: I see that Percy Heath plays bass on the 1954 session. Well, last Saturday I was extremely close to meeting his brother, Jimmy Heath. Heath performed in our local theatre with a Dutch jazz combo doing a guest appearance. I know a few staff members at the theatre and tried to ‘pull some strings’, brought a copy of the CD “Picture Of Heath” (a.k.a. “Playboys” on LP) for Heath to sign, but Satan must have been involved, ’cause by the time we reached the backstage area, it turned out that Jimmy had gone back to the dressing room to pick up his stuff and get ready to take off to his hotel. So we rushed to the artist exit, waited for Heath to walk out and then, believe it or not, the security guy told us that he’d already left! Would you believe that? I was only an inch away from a living legend, AND I MISSED HIM!! For a second I thought of dropping by the hotel, which is at a stone’s throw from the theatre, but I left it at that.